It’s THE WEEK BEFORE THE RACE, and the Gomers are excited and nervous and expectant and freaking out and all the feelings you’re supposed to be feeling before a big race. Some things that are helping them: A detailed race in preview, words of encouragement from the GomerNation, memories of races gone by…and oh yeah, juicing. Wish the guys luck on Sunday the 20th as they run the Rock N Roll Half Marathon in Phoenix! 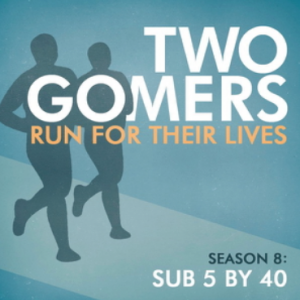 And don’t forget, you can still download the Two Gomers Choose Wisely and donate to help the podcast keep going strong. Happy Running!